Ever since the publication of his first string quartet collections, Boccherini was immediately recognized, with Haydn, as one of this genre�s founders and foremost exponents. 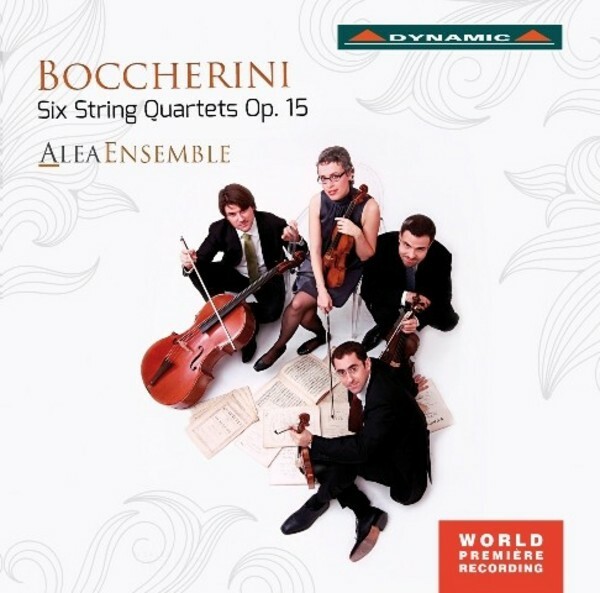 The six string quartets Op.15 are crucial in the history of development of Boccherini�s quartet production and, more in general, of the classical quartet. This collection, however, has never received the attention it deserves. Like many other chamber collections by Boccherini, this is mainly due to the lack of a complete score edition that would allow their study and performance. Today, Giuliano Castellani�s critical edition has finally made this recording of the Alea Ensemble possible, and will facilitate the study of these works within the context of contemporary string quartet production. Alea Ensemble was formed in 2002 by Fiorenza de Donatis and Andrea Rognoni (violins), Stefano Marcocchi (viola) and Marco Frezzato (cello). They are considered among the best early music interpreters of the new generation and are driven by the desire to perform on original instruments the great classical and romantic chamber repertoires as well as the finest works of wrongly neglected composers. The core of Alea Ensemble is the string quartet, which can sometimes be enlarged to include other instruments, such as double bass, harpsichord, fortepiano, guitar or wind instruments. Its members are section leaders and soloists in famous early music ensembles, such as Europa Galante, Accademia Bizantina, I Barocchisti and Tafelmusik.